In Civilization, players strive to become Ruler of the World by establishing and leading a civilization from the dawn of man into the space age waging war, conducting diplomacy, discovering technologies, going head-to-head with some of history's greatest leaders, and building the most powerful empire the world has ever known. Sid Meier's Civilization® Revolution™ is the latest offering in the legendary award winning Sid Meier's Civilization® series of strategy games, featuring the famous "just one more turn" addictive gameplay that has made this one of the greatest game series of all time. 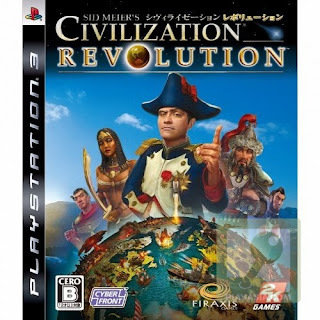 Civilization Revolution has been designed and built (by the legendary Sid Meier and his team at Firaxis) from the ground up for console and handheld systems delivering graphics, gameplay and controls that take full advantage of the hugely popular gaming platforms. Civilization Revolution is a watershed game offering players a chance to experience the epic empire building world of Civilization in a whole new way - in an accessible, visually immersive, fast paced, action-packed world that gamers crave.